I spent a large chunk of this past rainy Friday in a hospice room at the Veteran’s Hospital. Visiting with my cousin, Neil, and his sister Eva, reliving our childhood memories was time well spent. Neil and Eva are my first cousins, part of a family of six siblings. Their home was only a short hike through the fields. There was always something interesting going on there and I always wanted to be in the middle of it. Their mother never seemed to mind an extra kid or two running around her house. When one grows up like that, first cousins start to feel a whole lot like brothers and sisters. The reason Eva is staying with him is because sometimes Veteran’s hospitals are not all they should be. To make certain Neil is well cared for, Eva drove across several states and moved into her brother’s room. She is sleeping in a cot in his room, monitoring everything from his meds to his meals. She has always had a gift for turning everything into a party. She has decorated his room with family photos and other mementoes of his life. She offered me tea from her new Keurig machine as we talked. In addition to childhood memories, we also discussed the war. Neil was a soldier in Vietnam—part of a fighting group that went on near-impossible assignments. He told me that his officers frequently gave the impression that they did not expect them to return. It was on one of those missions, deep in the jungle, while low-crawling toward the enemy, that Neil saw a grenade arching through the air and heard it thud into the ground beside him. With no time to think, he did the unthinkable. He deliberately rolled onto his back, directly over the grenade, mashing it into the dirt with the heavy radio equipment he carried on his back, and absorbed the blast with his own body. 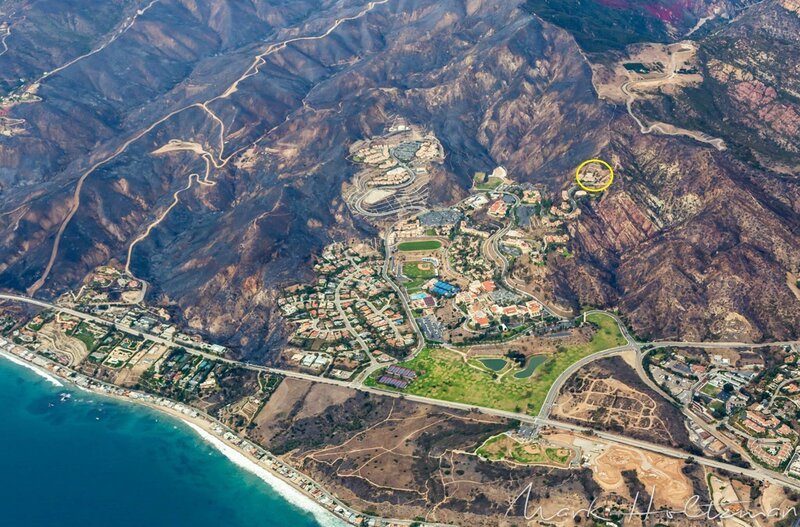 He had not expected to survive, but he did survive—in spite of extensive injuries. His quick action saved not only his own life, but the lives of all the other soldiers around him. Later, recuperating from his wounds in the hospital, he received an unexpected visit. General Westmoreland came to personally present him with his Purple Heart. Neil said Westmoreland stayed a few minutes to talk, thanking him for his heroism. Those few minutes alone with the commander of U.S. troops in Vietnam are among the most cherished of his life. 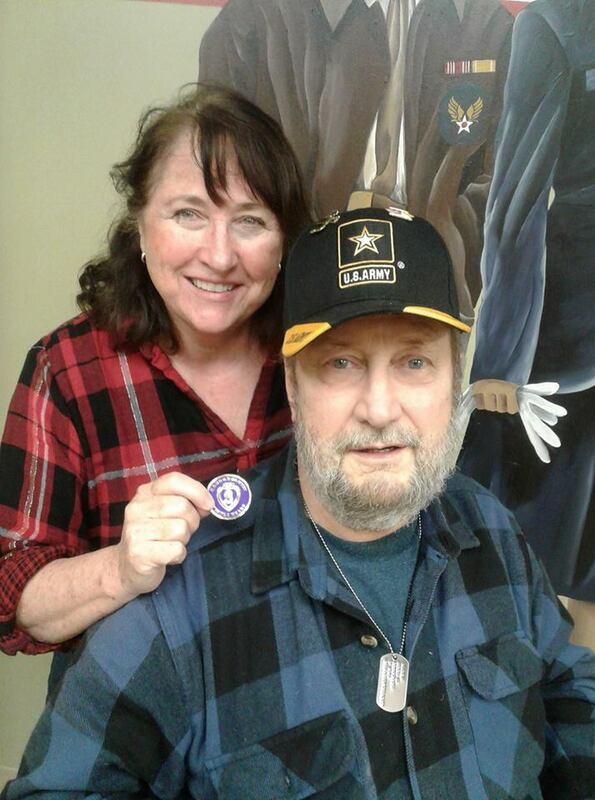 The Purple Heart medallion I hold in my hand in the picture, is a replica of the real one he has at home. He carries this one in his pocket. Neil is battling cancer. The reason behind the cancer is not a mystery. He and his fellow soldiers spent a large part of their time in Vietnam covered with Agent Orange. As we were talking about Agent Orange, he made a face as he brushed at his sleeve, as though still trying to brush the chemical off. He also described his bewilderment when, as he made his way home, there were strangers who tried to kick, hit, and even spit on him because of his uniform and participation in the war. My cousin, for most of his life, did not talk about his war experiences. He tried to forget and move on with his life, but there are some things that are impossible to forget. Like so many returning soldiers, he struggled with relationships and work. Like most of us, he has not led a perfect life. But now, as he faces the cancer that, barring a miracle, will eventually consume him—it is encouraging to see the soldier coming out in him once again as he faces his future with an impressive dignity, faith, and courage. Years ago, while fishing on Ice Lake on Manitoulin Island in Canada, my family and I discovered the ruins of a huge, mysterious-looking stone house overlooking the lake. There wasn’t much left standing except a few portions of the old stone walls. Later, we met a man in Michigan who had grown up in that house. He had a photo of it hanging on his nursing home wall and he told us stories of how their family had built the house with rocks that they dragged from the earth with horses. Soon after that we heard the good news that the house, which the islanders called ‘Stoney Castle’ had been purchased by an outsider who was having it rebuilt. The difficult restoration project was tackled by Sheppard Bros. Construction, a company known on the island for the quality of their work. The next time we went, the house had been restored to its former glory. The new owner was kind enough to allow us to make a video to take home to show our nursing home friend. In showing us the house, the new owner said that master stone masons were rare, and he had worried about finding one expert enough to take on the complicated task. 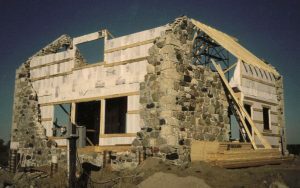 Fortunately, one of the best lived on Manitoulin Island, and Sheppard Bros. Construction was able to hire him to do the stone work. The owner proudly pointed out how well the old walls had been blended in perfectly with the new. Ultimately, that experience inspired the thread in my latest book series. Love’s Journey On Manitoulin Island. Which is a story about a master stone mason who takes on the job of restoring a derelict lighthouse and the granddaughter of the family who once lived there. While researching stone masonry for the story, I read a book written by a stone mason. My favorite portion was a passage in which he explained that the human eye craves variety, and that is why stone walls are so much more appealing than those built with concrete blocks. 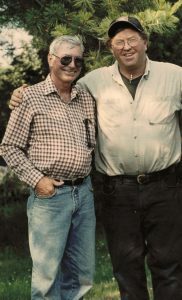 He described the value of each stone being unique and said the stones he worked with often seemed to take on personalities. Sometimes he found a stone that was such an odd shape he thought he’d have to throw it away. Then there would come a moment when that “grumpy old rock” turned out to be the perfect fit for some portion of the wall which would be stronger because of it. I thought back to how many times my husband, during his years of ministry, would deal with an individual church member who just didn’t seem to fit in. Then suddenly, there would be this unique niche only that “grumpy old rock” could fill, and the church would be stronger because of it. 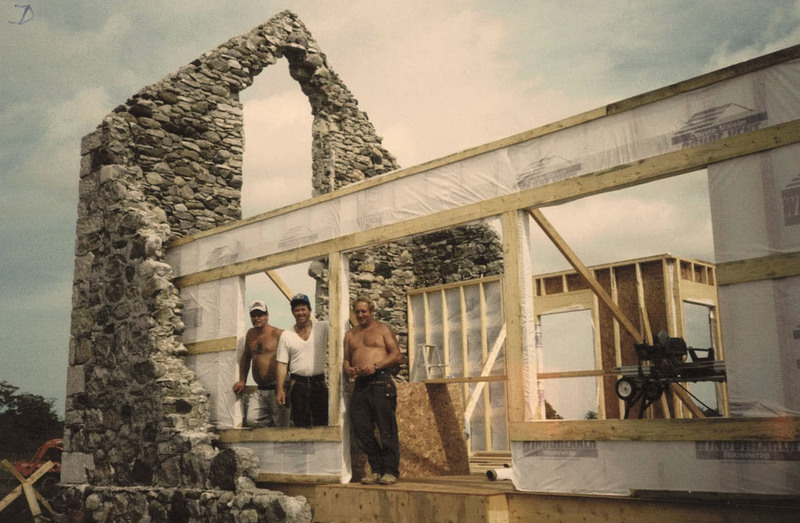 To my delight, a reader who lives on Manitoulin Island, Wanda Whittington, recently sent me photos of some of the men who rebuilt Stoney Castle. So many readers have contacted me since the first book came out, telling me about their own good memories of Manitoulin Island and their first glimpse of Stoney Castle that, with Wanda’s permission, I’m including these photos for their enjoyment. Love’s Journey on Manitoulin: Moriah’s Fortress (Book 2) was released Friday (September 1st) and I’m really excited about this new series and I hope everyone really enjoys it too! I can’t wait to hear what people think about it!